Overall: 19"W x 24"D x 36.5"H.
I was nervous when ordering these chairs for my dining table, but I ended up ordering 6. They are great quality, better than expected. The chairs were durable, clean and easy to put together. Their appearance was as seen in photos. These are so elegant and modem in my marble kitchen. They are super comfortable. They arrived in perfect condition, packed two to a box and were well padded and protected. I think they are a great value and I'm pleased with the quick and efficient service. They look wonderful with our glass top dining room table. The look is sophisticated, elegant and much more expensive looking than the actual cost of the chairs. 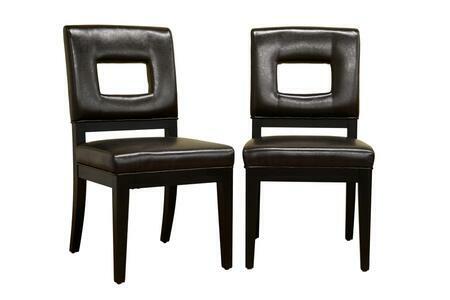 We purchased these Wholesale Interiors chairs from the Faustino collection for our kitchen dining area. I have a 2-year-old so I needed something functional, durable and easy to clean. We have been using these chairs for a few months now and I have been very happy with them. My husband and I needed chairs and a matching small table to fit a dining nook in our kitchen. These chairs are very traditional in styling which we loved. Solid construction. Clean finishing. I received the chairs from Wholesale Interiors 3 days ago. I really like the Faustino Collection. They are great for what I wanted and they are comfortable. Better yet, my young grandchildren think they are wonderful. These chairs are stunning and so comfortable to sit in. The chairs arrived on time. I was amazed at the quality and workmanship of the Wholesale Interiors chairs from Faustino Collection. They are very durable and the leather will be easy to keep clean. High quality and sturdy wood. Nice wide seat and comfortable back. I will be buying 2 more! The assembly was easy, the look completes my farmhouse style dining room and offsets the 2 antique rattan chairs perfectly.